The ancient fishing village of Cassis is considered by wine importer Kermit Lynch to be an “earthly paradise”. The vineyards of Clos Sainte Magdeleine are breathtaking as they jut out on a private cape of limestone cliffs with spectacular views above sparkling Mediterranean. Only a handful of vignerons today are fortunate enough to produce A.O.C. Cassis. The production is low and most is consumed locally with fresh fish. The Sack-Zafiropulos family has been making wine here for four generations and has continued to craft wines of grace and finesse, just as they were when founder Jules Savon won the Gold Medal for the domaine at the World’s Fair in 1900. Bishop’s Cellar is excited to acquire two cases of such a limited artisinal and organic wine. If you can’t get to Cassis anytime soon, you might as well drink like you are there! 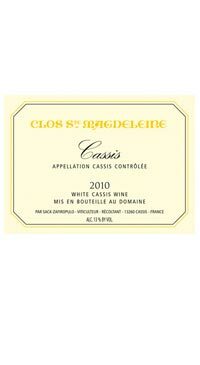 Clos Sainte Magdeleine Cassis Blanc is a blend of 40% Marsanne, 30% Ugni blanc, 25% Clairette, 5% Bourboulenc grown on clay limestone soil. The juice is fermented in temperature controlled stainless steel tanks tanks and the lees are filtered off of the wine, then re-introduced in before racking. The wine is aged for 14-18 months in stainless steel and in most years undergoes malolactice fermentation. The wine captures a beautiful balance between sun ripened richness and liveliness, making it a very food friendly wine as well as delicious on its own.